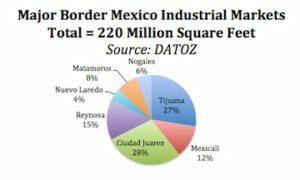 The borders of Mexico were the first beneficiaries of the maquiladora (or in bond) program in the 1960’s. Foreign companies could import machinery and raw materials duty free, as long as they promised to re-export the final products. The Maquila Program or Border Industrialization Program, was intended to provide jobs for guest workers left unemployed after the end of the Bracero program which ran until 1964 – As many as 450,000 Mexicans had worked the fields in the US and returned for winter at home in Mexico. Ciudad Juarez, across the Rio Grande from El Paso Texas and Tijuana on the west coast of Baja California, adjacent to San Diego became manufacturing hotbeds. Tijuana became the TV capital of the world as Japanese manufacturers like Samsung, Panasonic, Toshiba, Sony, Sanyo and others came to assemble electronics that had mostly duty free access to the US markets. The peak of the border market was 2000, when many of the Japanese and some of the Korean companies closed or cut back operations. At that time, countervailing duties were imposed on some Chinese electronic components in Mexico in retaliation for toy dumping charges, the .com recession was in full swing and China had just received most favored nation status from the US allowing very low duties from a country that had $0.25/ hour wages, while Mexico’s border starting wage was closer to $1.00/hour. 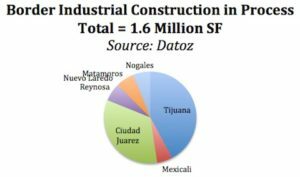 The vacancy for industrial real estate after the 2007 crash reached double digits for the first time since Maquilas were established, reaching close to 20% in Tijuana and Juarez, as the economic downturn combined with a drug war cut employment back by 30%. Since then vacancy has dropped to an average of 7.5% in the border markets with Tijuana and Nuevo Laredo posting about 5%. Construction is not keeping up with growth and vacancy trends are going down. The graph below shows the relative sizes of the major markets. Tijuana stats do not include Tecate and Rosarito- Adjacent municipalities that make up about 10 Million SF of additional space within the same metropolitan area just south of San Diego, California. These markets have recently seen the acquisition of Sharp’s TV plant by Hisense from China, and a 25 acres land purchase by Hyundai for a new container plant. Ciudad Juarez has typically landed the bigger companies, with about 20% larger factories servicing the entire US from a more strategic location and a functional rail connection. Tijuana, however, has more, many which support Southern California operations and offer executives who typically live north of the border a Southern California lifestyle with great beaches and weather, but at a higher cost. New construction is concentrated in the larger border markets as well. Labor turnover rates have been climbing as new factories fight to recruit experienced laborers in medical, electronics and other advanced fields, and in spite of the peso devaluations, which affects the value of peso denominated minimum wages (currently around $0.55/hour depending on region and occupation) dollar labor rates have not dropped significantly in the border markets and labor turnover is increasing. Along the border, industrial real estate markets grew at a 5% rate in 2015 with Juarez and Tijuana each absorbing about 3.5 Million SF. Mexicali was the fastest growing with NOV and a strong aerospace industry, absorbing 2 Million SF. As the border labor markets and infrastructure became stressed, Mexico opened up the Maquila Program to inland areas of Mexico. Monterrey, Guadalajara and Mexico City all have growing markets and the Bajio has recently received huge investments from the auto industry. Queretaro, a charming colonial town, has become an aerospace hub as Bombardier and many of its suppliers have located there and established programs in Avionics and related fields at the local universities. 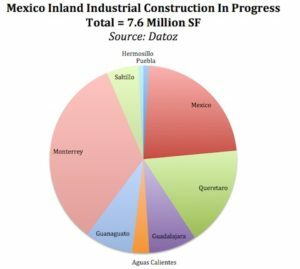 Monterrey has been the industrial center of Mexico for decades and continues to be the largest and one of the most active markets with over 2.5 Million SF of new construction underway.